I believe I’ve discussed this subject before, but I thought it was worth mentioning again because it is one of the questions we get asked most often at trade shows. Templates can be very useful when you’re just starting out with a new sublimated product, but they often don’t come with the product when it is purchased. At some point EnMart plans to have templates available for download from our web site, but that requires time to get all the templates loaded and identified. In the meantime, it seems simpler and more efficient to point you to sites that are already offering templates. Unisub is one of the main manufacturers of items for sublimation. A great many of the FRP items come from Unisub. Given that, their site is always a good place to look for templates. They have a wide variety of templates available for download in both .eps and .cdr format. Unisub also offers a series of tip sheets that may be helpful. Another place where you can find templates is on the Rowmark website. EnMart is a Rowmark distributor so you can find templates for the majority of the products we carry on the Rowmark site. The templates available from the Rowmark site are in PDF format. 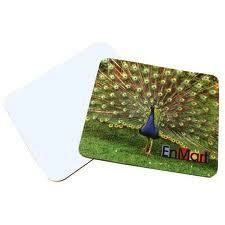 You can also find additional templates by clicking on the sublimation products link. Rowmark also provides temperature and press time information for their products. Any discussion of templates should also include a mention of Hanes SublimationMaker 2.0. This software features both the Unisub and Rowmark templates as well as the ability to create custom templates. Hanes SublimationMaker also allows you to create your own templates and designs. If you’re interested in creating murals or custom tabletops, you might want to take a look at this software as well, since it has mural making capabilities. Finally, I wanted to remind everyone not to neglect the Sawgrass website when you’re looking for help and information. Sawgrass offers how to videos for digital decoration. They also offer a handy desktop sublimation pricing calculator for download. You can also find instructional webinars on their website. If you’re just getting started with sublimation, the Sawgrass website is a treasure trove of information. Of course, as always, EnMart is here to be of assistance as well. If you have a question or need assistance, just contact us and we will be glad to help. You can also follow us on Twitter or Facebook to keep up with the latest news and information.